Get the most out of your gaming experience with the innovative TeckNet M009 Gaming Mouse.Designed for comfort and built for precision,this is one bit of kit no gamer should be without,at a price every gamer will love. With a 1ms report rate, TeckNet HYPERTRAK Gaming Mouse is up to 8x faster than standard mice - which means when the mouse is moved or clicked, the response is near-instantaneous. 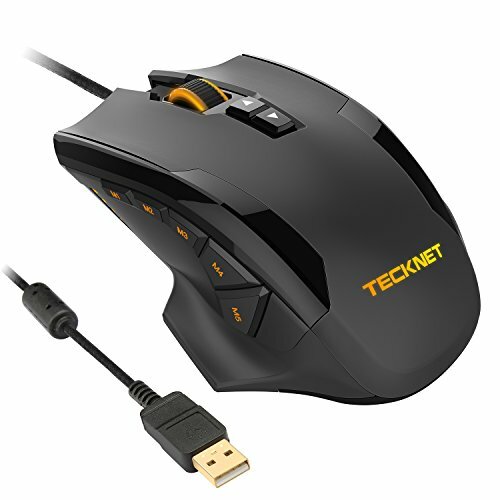 TeckNet HYPERTRAK Gaming Mouse comes equipped with the Avago ADNS-9800+ optical sensor - widely regarded as one of the best gaming mouse sensor on the market. ADNS-9800+ has zero smoothing, filtering or acceleration across the entire DPI range (250-16,400DPI), delivering exceptional tracking accuracy and consistent responsiveness at any speed. With a lightweight construction and included 6x10g removable weight, you have options when it comes to tuning the mouse to your preferences. With onboard memory, you can save your settings to the memory on the mouse and use your settings on any PC without needing additional software or requiring a log in to use them. Use TeckNet Gaming Software to program your favorite commands and macros to each of the up to 10 buttons. With TeckNet Gaming Software, you can select from a spectrum of colors and synchronize lighting patterns and effects with other Logitech G devices. Designed for comfort and durability, the left and right buttons have been successfully tested for 10 million clicks.